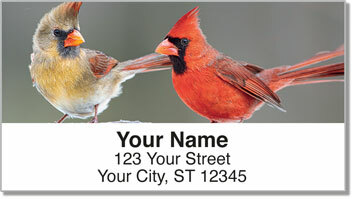 Quaint illustrations of cardinals bring your favorite backyard bird to every envelope you send! 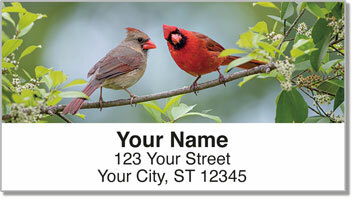 These delightful return address labels feature original designs of the bright red songbird. Cardinals are so popular in North America that seven different states have made it their official bird! At one point, redbirds were mainly found in the southeastern United States. But thanks to birdwatchers and nature lovers who put out seed all winter long, they are now flourishing much further north! 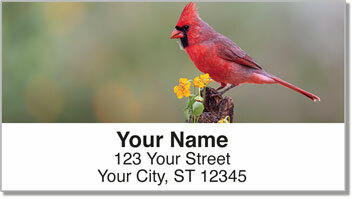 Redbird Address Labels from CheckAdvantage will add color and charm to your letters and packages. Completing the routine task of writing your name and address on outgoing mail just got much easier! Simply peel, stick and be done with it! 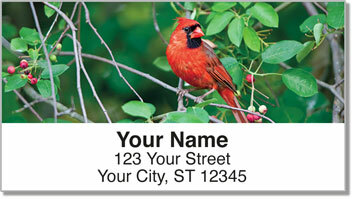 Get your own Redbird Address Labels now! You can also order this design in matching personal checks!